The Caribbean 2700 Sports shares quite a lot with it’s more traditional Caribbean Flybridge and Runabout configurations but with one considerable difference… Two 250hp Verado Outboard engines! 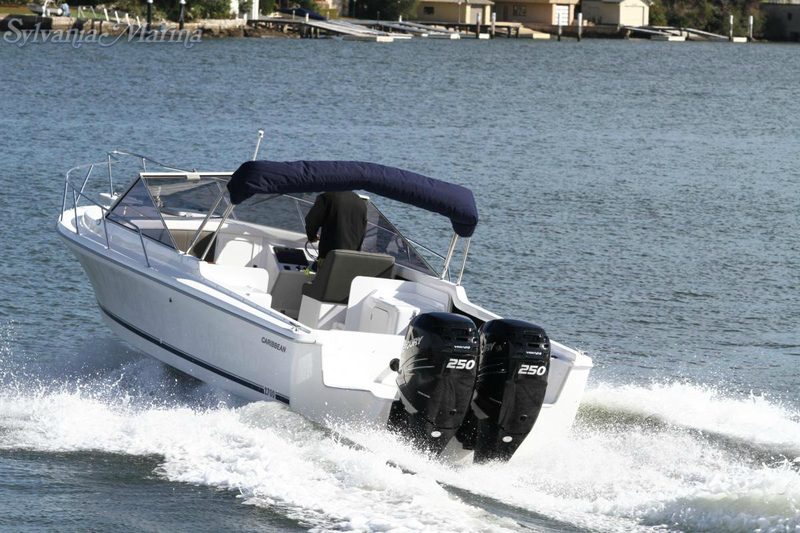 Each of the 3 configurations share the same well regarded blue water hull that has become known for it’s ability to provide a smooth and stable ride through even the nastiest of conditions, however, the Sports offers an open and uncluttered cockpit with no engine box and instead features the outboard-well, a built in bait tank and transom door. Far from being the first time this model has seen changes, starting life as Bertram 25, then Caribbean 26, before the last big change in 2009 bringing the much wider (3.21m) bodied 27 footer. The boat has improved with every redesign, rethink and review and this new way of thinking is no different. An L-shape lounge and table fitted to the port side, fold away rear lounge against the transom and a large helm seat creates enough room for the whole family as well as friends making for a user friendly, versatile open layout that is the ideal day boat or offshore fisher. Amenities such as a moulded ice box, moulded sink unit and another ice box situated under the helm seat plus a lockable cabin with a bunk infill making a very large double berth, and there’s a pump-out toilet as standard means an overnight stay isn’t out of the question either. 550L of fuel and 160L of water under the floor further increases the cruising range and the nice, strong safety glass windscreen that has always been a Caribbean trademark gives some peace of mind that should the weather get nasty, you’ll have no issue pushing through and getting home safely. 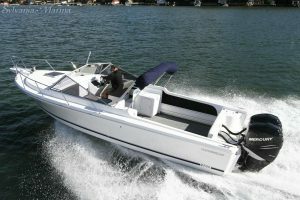 If you’re thinking of a great all round boat, the Caribbean 2700 Sports is a great option with timeless lines and over 50 years of boat building experience integrated, and some unique features that help bring down some of the usual costs associated with larger boats.